Doru Frantescu is Director and Co-Founder of VoteWatch EUROPE. 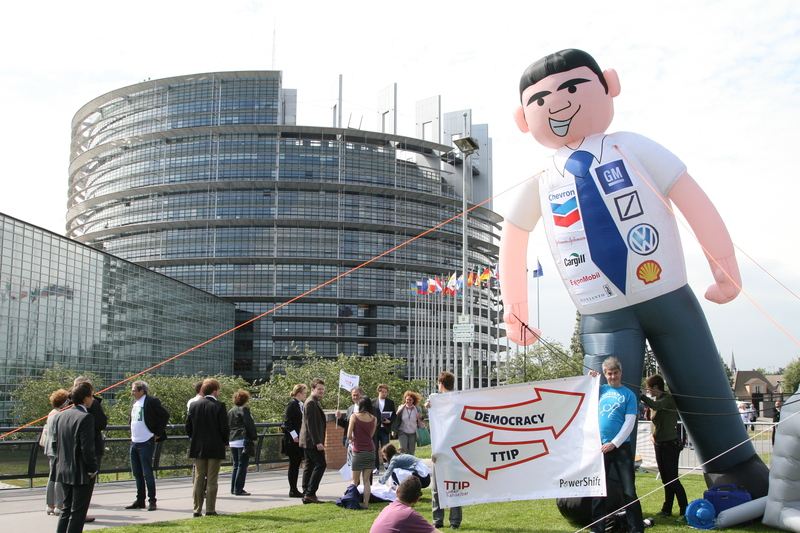 On 10 June, MEPs were supposed to give the Commission a clear outline on how and what should be negotiated in a Transatlantic Trade and Investments partnership (TTIP). The vote was however postponed. The official reason invoked being that there were simply too many amendments and requests for separate votes which would have made the voting session lengthy and difficult to follow by the MEPs. The postponement was decided formally by the European Parliament President, Martin Schulz, upon consultation with the leaders of the political groups. More precisely, the rescheduling was decided on the basis of article 175, which says that when more than 50 amendments and requests for a split, or separate vote have been tabled to a report in plenary, the President may ask the committee responsible to meet to consider those amendments or requests. Unofficially, it seems that the internal splits inside the main center-left group, the S&D, have made its leaders appeal to the EP President, which is affiliated with the same political family, to postpone the vote. The EPP was happy to go along with that. It is legitimate to ask why the postponement happened and what is likely to happen after all in the Parliament on TTIP. Firstly, the vote on TTIP would not have been the first on which many roll-call votes or separate votes were requested. According to EP website, there were 116 amendments drafted to TTIP in plenary and 87 requests for roll-call votes. The EP, however, voted in the plenary dossiers with more roll-call votes. On 5 February 2014, the EP plenary cast no less than 149 roll-call votes on the dossier “A 2030 framework for climate and energy policies” and many more separate votes by show of hands. Similarly, on 13 March 2013, MEPs voted 87 times by roll-call (and many more times by show of hands) on the “Decision on the opening of, and mandate for, interinstitutional negotiations on common organization of the markets in agricultural products” dossier. In addition, anyone who follows the EP knows that the annual votes on the EU budget are always very lengthy and tiresome, even at plenary stage. This makes it clear that the main reason was not simply technical, but rather political. The ‘EU affairs information market’ was filled with speculations during the week of the plenary, after the main political actors started a blame game by selectively ‘leaking’ information from the inter-group negotiations to the outsiders. A swift survey that VoteWatch conducted in the following days by electronic means only (website, social networks) shows what various publics made of all these arguments (based on over 200 answers). The people who are unfavorable to TTIP believe that the EP president is the main ‘responsible’, or the key factor which generated the postponement. With respect to political groups, this public places the blame in relatively close proportions on the two main groups, S&D and EPP. On the other hand, the group of people who believe that TTIP is a ‘rather positive thing’ also thinks that the S&D group was the agent that triggered the postponement, while the other leftist groups have also played a greater role than the center-right groups in suspending the vote. The postponement of the vote did not necessarily imply the deferral of the debate on TTIP. In this case, the plenary as a whole, and not the EP President, was the decision-making agent. Interestingly enough, the leftist groups would have wanted to still hold the debate, while the center-right was of the opinion that the debate has to take place the same day as the vote, and therefore should be postponed. The center-right won this battle by the narrowest of margins, 183 votes to 181. The difference was effectively made by a few socialist MEPs from Denmark, Sweden, Italy and Romania, who broke off from the group line and voted for postponing the debate as well. Despite this development, the camp supporting TTIP in the Parliament is still far stronger than the one opposing it. EPP, S&D, ECR and ALDE continue to be largely on the ‘pro’ side and can even afford a reasonable number of MEPs not following the group line (e.g. French and Belgian French-speaking Socialists). This is unlikely to change in the foreseeable future. As it stands, the only way in which TTIP as a whole could be rejected by the EP is if it includes ISDS, which would be considered unacceptable by a majority of MEPs. However, the Commission is aware of this and has come up with the softened version of the mechanism, which gives a stronger say to the public sector. As presented in an older comment, this move has brought about results, effectively ‘charming’ part of the socialist group within which the German delegation seems to be the most convinced. The position of the German SPD delegation is the key for three reasons: it is the junior coalition partner in Merkel’s government in the country whose population is the least convinced so far about the benefits of the TTIP; it is the second largest in the S&D group; it features the EP rapporteur on TTIP, Bernd Lange. The disputes within the Socialist group on ISDS were foreseeable already 6 months ago, when the group decided to abstaine on a reference to ISDS in EU’s competition policy dossier. All in all, it seems that, at this moment, the currently proposed form of ISDS has a majority in the European Parliament, but this is fragile and there is a long way to go. Having learned the lesson from the dismissal of ACTA in 2012, the Commission will not want to risk sending an agreement to the EP as long as there is even a small chance of failure. Even the adoption with a small margin would be dangerous, given the big size of the deal and its implications, and the fact that it will have to be implemented in the member states. Consequently, the Executive and the supporters of ISDS have more work to do to convince the public opinion, particularly in key states, as Germany and Austria (where the support for TTIP is the lowest). If the supporters of ISDS can achieve that (which is far from being certain), that would serve as a solid basis for a larger majority of the S&D group to vote in its favour (though this will not be the case of the ‘most leftist’ factions of group). If no significant progress will be observable in this direction as the TTIP negotiations reach the final stages, then the investor’s protection clause will be considered too risky to include in the document that will be sent for approval to MEPs. TTIP, CETA & GLOBAL TREATIES/’ARRANGEMENTS’. The European Union’s Commission’s receipt of: “The NOTIFICATION of Pre-existing CHALLENGE to the EU – Canada Comprehensive Economic & Trade Agreement (CETA)”; EU may consider “Renditioning Info” as Condition of CETA Deal to Minimize “Unethical & Inhumane” Arrangements between Canadian lobbyists’ clients/parties’ executives; CHINA Unprotected with C-CITreaty? “The NOTIFICATION of Pre-existing CHALLENGE to the Canada – EU Comprehensive Economic & Trade Agreement (CETA)”, #00000001. 2) sharing with you, et al, more of the relevant information that you may have been deprived of. And, as the sharing of the information regarding the basis for the aforementioned “NOTIFICATION of Pre-existing CHALLENGE to the Canada – EU CETAgreement”, is essential in preventing any divisiveness in the EU (ie. any desires to make separate, &/or, private arrangements), &/or, by other interested parties, would you please confirm that you have disseminated the provided information to all of the EU members? I’ll contact some of the members to see who you may have left out. “Towards a More Informed Opinion regarding the Environmental Impact & Context of the NGP (Pipeline), et al”, Researched & Submitted by D.E.H.S., July 24, 2012 to the Enbridge Co.’s NGP Joint Review Panel. Sidney, British Columbia, CANADA. V2L 2C8. 2) enhance, &/or, maximize the benefits (ie. the direct cash dividends & other) to, both; the shareholders & the non-shareholders in Europe, China & Canada, particularly in the area of co manufactured products. while continuing to render the non-Canadian shareholders harmless & free of any associated costs*. David Smith, Sidney, British Columbia. to acknowledge their receipt of their “NOTIFICATIONS of Pre-existing CHALLENGE to the Canada – EU Comprehensive Economic & Trade Agreement”, I’ll informed them, et al, of the receipt of your acknowledgment. I’ll also pass along the Prime Minister’s acknowledgment of his receipt of his (the Canadian government’s, & thereby, corporate Canada’s) copy of “The NOTIFICATION of the Pre Existing CHALLENGE to the CETA” & the aforementioned information, etc., to you as soon as soon as I receive his acknowledgement. Incidentally, I hope that you will understand that by the EU utilizing the enclosed, &/or, any other information that I have provided you with, it will not give the EU an unfair advantage over the Canadians, & thus, it will not give the Canadians, or, any third parties, a basis for making other “CHALLENGES” to the CETA. On the contrary, one of the purposes of “The Pre-existing CHALLENGE” is to eliminate the basis for corporate Canada, et al, utilizing the aforementioned information as a basis of challenging the EU at a later date. However, by acknowledging the “Pre-existing CHALLENGE”, it does not prohibit some non-shareholders from utilizing corporate Canada’s funds to successfully challenge, both; corporates Canada & European Union & then, being compensated by corporates Canada & Europe Union at a later date. the continuation of the global funneling of the instruments of commerce, ie. monetary value, into the reserves of fewer & fewer people in the “growing global economy”. 2) the EU beneficiaries of the CETA can arrange for the EU’s taxpaying non shareholders to pay dividend enhancing “penalties” to corporate Canada & its shareholders? c) determination of the amounts of their financial damages, punitive penalties & awards by way of their secret tribunals that may have different versions of “ethical”, &/or, “humane” considerations, as opposed to, “legal” considerations, than the 95% – 99% of the EU’s penalty paying, non-shareholders, et al? 1) further investigate the enclosed issues, questions, etc. before agreeing to the proposed CETA? how much room do you & the citizens of EU, et al, think that there is for deniable abuses of the CETA “system”? 6) President Peter Tomka, International Court of Justice, Peace Palace, Carnegieplein 2, 2517 The Hague, The Netherlands. help you to minimize, &/or, eliminate a large portion of the basis for “The Pre-existing CHALLENGES” to the CETA & its potential penalties & punitive awards for damages, etc. It may be an encouraging sign that many Europeans, et al, agree that by just “legalizing” the proposed procedures & practices by way of the CETAgreement, &/or, attempting to use the CETA to circumvent these contentious ethical issues, it can not release the direct beneficiaries of The CETAgreement from the aforementioned compensations, etc. And, while the above information provides a much greater certainty for the EU shareholders, the aforementioned, simple improvement to the CETA, also provides the non-shareholders with the information for the basis for much more informed opinions as to whether they might consider working for (with) any of the organizations, &/or, companies that have suggested that they have an interest in developing the aforementioned Canadian natural resources & the subsequent more equitable proportion of the aforementioned co manufactured of products. more favorable terms for your shareholders in other areas of the CETAgreement by way of the aforementioned Canadian, et al, lobbyists’ clients, such as corporate Canada, the Assembly of First Nations, et al? as a means of creating a much greater certainty for the value of the shares of your potential EU shareholders & the corporate European Union? As we know that there is much more to be accomplished in order to “guarantee” the aforementioned “greater certainty”, I look forward to more questions & the sharing of information regarding the enclosed & other, from the members of the EU Commission, EU Council, EU Parliament, corporate EU & its shareholders, its potential shareholders and non-shareholders, et al. b) expanded educational funding, etc.) to non-shareholders as a consequence of their approval of “the development” complete with an approved Compensation fund for missing the aforementioned targets, etc.